Manhattan and Amsterdam have a lot in common. The island of Manhattan was actually once owned by the Dutch and was named Nieuw-Amsterdam or New Amsterdam. One of the commonalities between the two cities is cycling. Cycling is pretty ubiquitous in both cities. 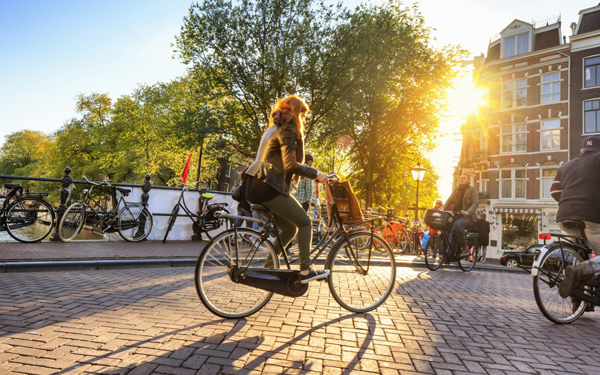 In fact, in Amsterdam there are more than 881,000 bicycles which is 4x the amount of cars. Resources like Citi Bike and Bicycle Habitat make it simple for cyclers to make bikes their primary mode of transportation in NYC- check them out! Check out our Perry sneaker in its newest color- Cobalt blue. A perfect match to your Citi Bike.